You must be bored to be reading this page. But since you made an effort to find us, I'll make an effort to explain how this site came into existence. Canoe and Kayak Lists came to me one night after yet again spending hours cleaning my gear following a group trip. I've noticed over the past few years that I bring at least three times as much stuff on trips as the average paddler. Now, most of the time the equipment is never used (thankfully), but when our group needs something, I seem to be the one that has the necessary item. Hence, my need to constantly clean and replace gear. Quickly thinking and slowly doing, I created a list of what everyone should bring on various trips. This site contains several of those lists, so you too will know what to take when you go canoeing or kayaking. I've probably forgot some stuff and included other unnecessary items along the way. Where you find errors or omissions please let me know at FloridaKayaker@gmail.com. 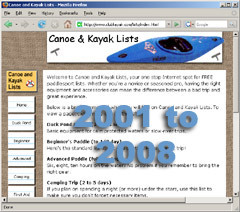 PS: If you're wondering what happened to the old "brown" Canoe And Kayak Lists, I retired the site on March 16, 2008. The new "green" site that you are viewing now is built with Adobe Photoshop and Dreamweaver. The old site was NetObjects Fusion. It lasted from 2001 to 2008 so I'm hoping to get a few miles out of the new guy. Take care. Are you a Florida canoeist or kayaker? Check out the rest of ClubKayak.com!